Close your cover after striking! a grand piano sound board looking fresh. A cover will help stabilize humidity. and playing Like Young for an hour. 1. It keeps kids and itinerate jerks from pounding on the piano. 2. It keeps dirt out of the piano. 3. It prevents random nicks and scratches. 4. 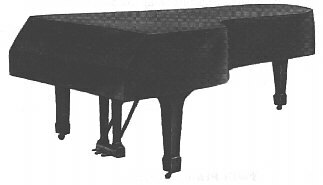 A piano cover keeps a more controlled environment for the piano during weather changes. 5. A piano cover tells your piano tuner that you take care of your instrument. There is a 6th good reason for a grand piano cover: it provides a better launch pad for the cats. The owners of any skid-marked-slide-stopping-gouged lids will know what I am talking about. Love your site and refer to it often. schools and public venues where durability and protective padding are important. This is a nice looking quilted cover with a sheen, and it is quite water resistant. (Pooled water could eventually soak in through the quilting stitches) As with the other covers, it has a soft inner lining. Covers shipped to Alaska or Hawaii must go US mail. Inquire when you call to order. pay the return postage. We pay all charges both ways and full cost of the cover for defective covers. in all things and will not side with either our supplier or the customer dishonestly.